If you’ve got your heart set on starting your first tropical aquarium, you’ve made a great decision. Although cold water fish tanks are often seen as a good option for beginners, they’re not always the best choice. Not only is there little variety in terms of fish, but it can be tricky to keep the water cold, especially in winter when your central heating is on full. This article will walk you through the key choices to be made when starting up a beautiful tropical aquarium for your home. Your first big decision is whether you’re going to start up a freshwater or saltwater aquarium, and cost is often a big factor in this choice. 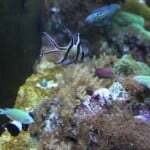 Saltwater aquariums usually require extra equipment and the fish themselves are more expensive. If you decide to have corals as well, these can really bump up the price. There are different saltwater set ups and a reef aquarium is the most expensive – so if you’re set on saltwater, you might want to consider going for a fish-only or fish-only with live rock tank (FOWLR). You’ll also find there’s extra work with a saltwater set-up. You have to mix the saltwater up before you do a water change, and you’ll need to purchase a hydrometer in order to test the salinity level. There are some comparable tasks if you own a freshwater aquarium though – for example, you’ll need to prepare the water for water changes with a purifier. 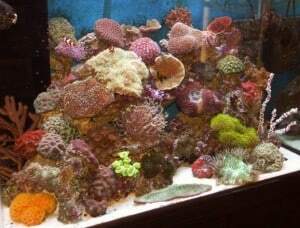 If you include corals, you’ll need special metal halide lighting which is really pricey both to buy and to run. For some corals, power compact lighting is okay but it is still more expensive than the regular lighting that you’d get in a freshwater aquarium. Despite being pricey and requiring more effort to run, there are good reasons why saltwater aquariums are so popular. Reef aquariums are simply stunning to look at, and the variety of corals, invertebrates and fish available is incredible. 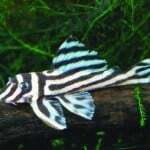 Overall, beginners are well advised to opt for a freshwater tank. There are still plenty of beautiful species to enjoy and a beginner is more likely to have success than with a saltwater tank. 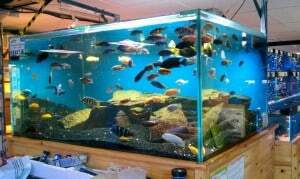 A good option for a beginner wanting a fancy looking tank is to opt for African Cichlids. These are tropical freshwater fish that are easy to look after but with their stunning colours, they look just like saltwater fish. Just make sure you don’t put African and South American Cichlids in the same tank! 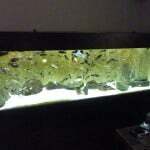 When it comes to choosing an acrylic or glass tank, there are pros and cons to both options. Acrylic often scratches (although it can be buffed) and it can distort from some angles so some people think it doesn’t quite look as good as glass, although others disagree. Acrylic is also a better insulator than glass so if you have a lot of lighting (for example, in a Reef tank) you may need to install a chiller. Acrylic tanks often have smaller access holes than glass tanks, making access more difficult. Glass tanks can be extremely heavy so you also need to consider how much weight both your stand and your floor can hold. If you have children around, there is a risk of your glass tank being damaged or smashed, and glass tanks are usually more expensive too. There’s no right or wrong choice: you need to decide what’s right for your circumstances and the sort of tank you’re setting up. For example, an acrylic tank is probably the best option for a FOWLR set up where there’s going to be kids around and cost is an issue. You must keep your aquarium away from anything noisy such as the TV or washing machine, to avoid stress to your fish. 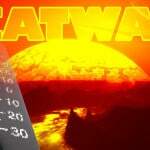 You mustn’t put the aquarium next to anything that might influence the water temperature such as a fire or a radiator. It is advisable to keep the aquarium away from strong light such as near a skylight or window, as this may result in a lot of algae growth. You must ensure that your aquarium is on a stand that can support the weight, and the floor beneath it is also sufficiently strong. You need to avoid placing your aquarium on a slant; otherwise the water may leak and it can cause stress on one side of the tank which may lead to cracks. An airstone, unless you’re getting a filter that has an air pump. A background if you want one. Two buckets, one for dirty water and one for clean water – these should never be used for anything else. A heater, thermostat and thermometer. A filter and replacement kits/materials. 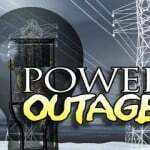 Lighting – make sure it is appropriate for your plants/coral. 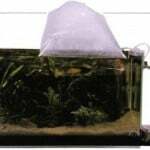 A siphon to help with water changes. 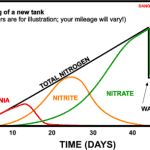 A testing kit to help you keep an eye on ammonia, nitrite and nitrate levels. A timer for your lights – not essential but good for your fish as they like a steady ‘day and night cycle’. Decorations – make sure they are safe and suitable for the set up you’ve chosen and the fish you want to keep. All electrical equipment that you buy should have a drip loop to ensure any water runs onto the floor and not into your electrical sockets. Make sure you rinse your gravel or substrate well then carefully scoop it into the tank, taking care not to scratch the tank surface. It is a good idea to create a gentle slope which is higher at the back and lower at the front. Then add the water (either saltwater or water treated with de-chlorinator) – if you place a small dish on the floor of the tank, you can pour the water into that and avoid displacing the gravel. Add in your decorations, attach your filter and make sure it’s working. Then add in your heater, following the instructions that came with it carefully, and set it to the proper temperature. Pop in your thermometer and make adjustments to get the temperature in the 24°C – 28ºC range unless you will be purchasing fish that require something different. Add on the lid/hood and lighting, attaching it to the timer if you have one. Add in any live plants as these will help prepare the tank for your fish. Finally test your water for pH, hardness, nitrates, nitrites and ammonia, ensuring that the levels are as recommended. Your pH should never be allowed to drop under 6.0 and you should test this at least monthly. After you’ve set everything up, you should leave your tank running for at least 48 hours before adding in your fish and many experts recommend that the tank is kept running without the fish for at least a week. This helps the temperature to stabilise and gives you a chance to get the levels right. Your fish should be added in slowly at the rate of 1-2 small fish per 40 litres at most – and you should continue testing the levels every day. Feed the fish sparingly to start with – every other day is fine. Following this process, the tank takes about 4-6 weeks to stabilise and once this is done, you can feed regularly and add fish more quickly but do keep an eye on the levels at all times and perform partial water changes if they become too high. This guide was contributed by an expert from Swallow Aquatics. You’ll find everything from fish tank filters and pumps to aquarium lighting in their online store. 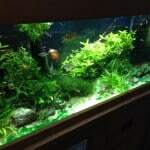 This entry was posted in Articles All, Articles Aquariums and Products, Articles Fish (Freshwater), Articles Fish (Marine). Piranhas have razor sharp teeth which they use to puncture their victim and strip away the flesh!